Ponferradina's dream of beating the giant Real Madrid came to an end last night, as the Merengues easily defeated their opponents by 5-1. Cristiano Ronaldo and a few other usual starters were allowed to rest for this game, since Real Madrid already had achieved a 2 goal lead from the 1st leg round, played last week. Christmas break came early to a few Real Madrid key players, such as Cristiano Ronaldo or Xabi Alonso, after José Mourinho decided to rest them in last night's match against Ponferradina, which the Merengues won by 5-1. With this victory, Real Madrid got through to the last-16 stage in the Copa del Rey and the next round draw will be made this Friday. Callejón was the MVP of the night, after scoring a brace and reaching his 9th goal of the season for the club. Nuri Sahin, Varane and Joselu scored the remaining goals. Very few people believed that Ponferradina could be able to pull off a surprise in the Santiago Bernabéu, despite Mourinho decided to go with several second choices in the line-up. The Merengues had a 2 goal lead advantage from the 1st leg and now playing at home, everyone knew it should only be a matter of time until they actually managed to break down the resistance. 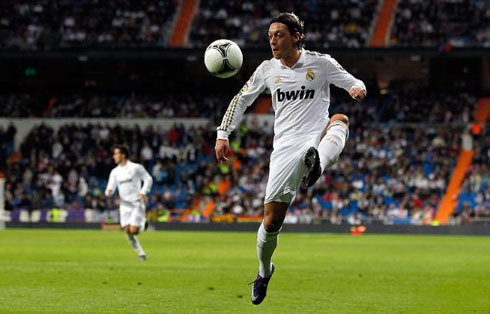 It took close to 25 minutes, as Mesut Ozil found out Callejón's great move escaping the defenders and put him 1 on 1 with Ponferradina's goalkeeper, Orlando Santana. The Spanish winger showed his speed and ice-coolness in front of goal, by opening the hostilities in the Santiago Bernabéu. The second goal would arrive close to half-time, by Nuri Sahin, after a corner kick taken by Ozil, who had just made his 2nd assist of the night. Nuri Sahin scored an unusual header goal and put Real Madrid with a more comfortable lead just before the break. Real Madrid would start the second half by pushing forward, which allowed the team to extend the lead to 3-0, after a good free-kick taken by Granero and that Ponferradina's goalkeeper didn't manage to hold, allowing the succesful rebound by the Frenchman, Raphael Varane. José Mourinho men relaxed a bit and Ponferradina finally reached their goal of honor in the 54th minute, from a counter-attack play. The goal put a stop to a new record that Real Madrid set in the Copa del Rey, which is now 617 minutes without conceding a goal. If the Merengues manage to repeat that achievement once more, then most likely they'll end up by lifting the trophy at the end of the season, since they are only 4 stages away from it (last 16; quarter-finals; semi-finals; final). But there was still plenty of time to seek more goals and even though everything was already settled, Real Madrid scored their 4th of the night, by the 21-years old, Joselu. Two minutes before the end of regular time, Callejón striked to the back of the net for the second time on this night and set the final score to 5-1. Real Madrid will now enter Christmas and New Year's eve break and will only return to action in the 8th of January 2012, for a La Liga fixture against Granada, to be held in the Santiago Bernabéu. Real Madrid next game is against Granada, for La Liga, in the 8th of January, 2012. In the meanwhile, this Thursday you can watch Tottenham vs Chelsea for the English Premier League, as well as Fulham vs Manchester United on Wednesday. This Thursday, don't miss the chance to also watch Barcelona vs Hospitalet for the Spanish Copa del Rey, all available from our football live streams section.